New York -- A wide selection of important and timeless prints from heralded artists such as Steven Frykholm, Keith Haring, E. McKnight Kauffer, Alphonse Mucha, Edward Penfield, Henri de Toulouse-Lautrec, Andy Warhol and many others will be in Poster Auctions International’s Auction #77, scheduled for Sunday, February 24th. Notable in the catalog are full, rare collections, such as Steven Frykholm’s Herman Miller Picnic: 20 Posters - a delightful mid-century modern foray expected to command $14,000-$17,000; the lively Collection of 37 Polish Circus Posters (est. $5,000-$6,000); and Alphonse Mucha’s renowned four prints from The Seasons (est. $60,000-$70,000). 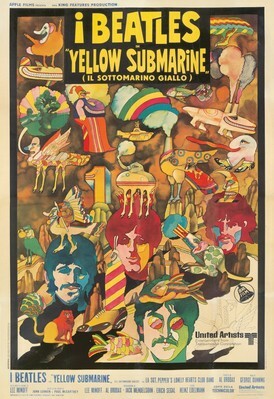 Image: Two-sheet Italian poster promoting The Beatles’ 1969 animated film Yellow Submarine, unsigned and by an anonymous artist, 52 1/2 inches by 76 7/8 inches (est. $1,700-$2,000).